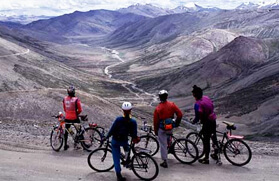 The great Himalayas of the Kumaon region are one of the scenic mountain bike tracks in India, with huge terrace fields across the lush mountains. 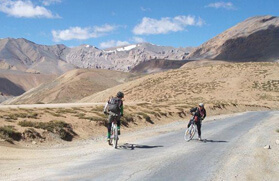 Apart from pilgrimage places, there are various beautiful places that are must watch if you are travelling to Uttarakhand and can be best explored through mountain biking. Biking in Kumaon can bring you closer to this place. It can help you in closely observing the naturally beautiful Kumaon, its people and culture. 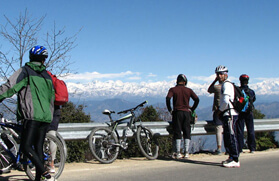 Mountain biking around the flat lands of Almora can be relaxing and pleasing. Moving ahead to Bageshwar, an ancient jungle and along the Gomati River, you can have a stay nearside the river and enjoy camping on the way. Further, moving on to Kausani, you will find a steeper land. From there you can have a bike trip to Someshwar and Ranikhet, both these places are best to discover the countless orchards and the botanical gardens. You can ride to Corbett Park from here and then visit Kaladungi, once residence of Lt Col. Jim Corbett. After an overnight stay, you will reach Chorgalia, the ending point of the tour. 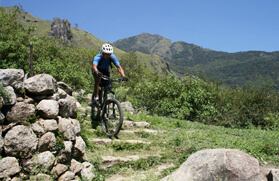 At Trekking in India, we offer an amazing Mountain Bike Tours in Kumaon that can meet the rising demands and expectations of adventure lovers. 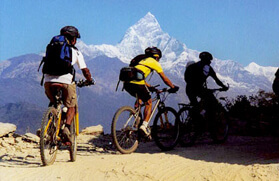 Our Mountain Bike Tours in Kumaon will allow you to travel and accommodate in the heart of Kumaon. Starting from the flat tracks in the Almora district, our tour will take you through Bageshwar, a renowned religious centre famous for a Lord Baijnath temple to numerous small villages, towns and dense Oak forests that abounds in wild life. Wild board, Baring deer and Leopards can be commonly found across Kumaon. Also, you can enjoy the overwhelming views of snow-capped mountain peaks. 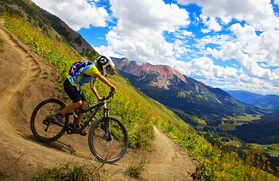 If you love biking and want to take this dare, then avail our Mountain Bike Tours in Kumaon and join us today. Drive ex Delhi to Nainital and than to Saattal. Arrive late afternoon and hot lunch is served after the welcome drinks. Post lunch at Leisure. Evening, introduction by the professionals in the field of mountain bicycling. Overnight at deluxe camp. Day 08: Corbett - Kotabag 23 kms. Day 09: Kotabag - Kaladungi 15 Kms. A small village which has the Corbett museum and the house, once residence of Lt Col. Jim Corbett. Over night in the farm house. Day 10: Kaladungi - Chorgalia 30 Kms. Through the gujjar villages situated amidst the thick Jungles, once the reign of the Famous Dacoit Sultana, giving the place its name. Leave for Delhi after late lunch by coach.